Richard Florizone has settled into his office. After pleasantries have been exchanged, he asks about the weather. In only a few days it’s gone from a blizzard to rain and melting snow. Halifax weather, we shrug. 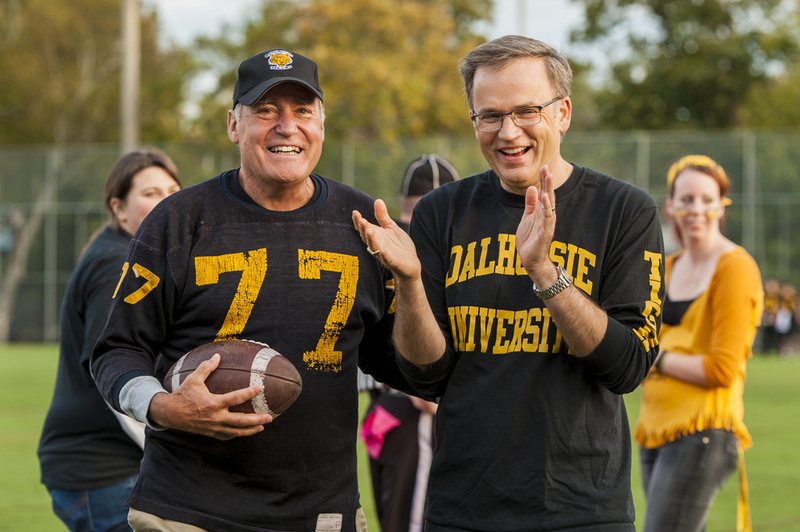 Dalhousie’s 11th president has become acclimatized to wacky Maritime weather—similar to how he has familiarized himself with his new gig. He began his new day job last July by listening to the university’s stakeholders. His recollections guided the 100 Days report, an introductory essay on where Dalhousie is today, its successes and struggles. A graduate of MIT and a former employee of Bombardier, the World Bank and the University of Saskatchewan, Florizone sat down with the Gazette to discuss what his 100 Days of Listening taught him about Dalhousie, student issues and the university’s future. Dalhousie Gazette cover for Jan. 17. Gazette: I’m sure many things surprised you during your 100 Days consultations. Anything stand out? Richard Florizone: I don’t know that there’s so much that surprised me as what amazed me—it was the students. We’ve got this student body that is unique in Canada. We have a higher percentage of out-of-province students than any other major university in Canada, more than McGill or UBC. At the same time, we also educate more Nova Scotia students than any other university, so it’s a really interesting, diverse mix. The other thing I find amazing, too, is this idea that the largest segment of our students identify as ‘conscientious achievers’. Students who are academically serious, but want to make a difference in the world, and I guess that amazes me, because I suppose I identify with that segment myself. Next, I would say the faculty. I think we’re very academically strong given the limited resources we have. And I think our faculty have done a great job. We particularly do well as individual researchers—we have a lot of talent at this institution. The only [thing] that surprised me, I suppose, was this retention issue. We have this amazing student body. We’re attracting students. We’re seeing applications and acceptances really up this year. But there’s something in our retention from first to second-year—we’re seven to eight percentage points lower than the U15 [a group of 15 Canada research universities] average—and I don’t know what’s going on there. G: Let’s dig further into student retention. You know it’s an issue, but you’re not entirely sure what it is. What theories have you heard? RF: The goal of 100 Days was not to solve all of these things; it was to do a quick scan, and to figure out together what are the things we want to focus on as a community. The things we heard anecdotally, probably the biggest one is in our international students. That’s where our retention is the lowest, and so then the question becomes, what are the support systems we have in place for international students? I’ve heard, and again this is an anecdote, there are challenges in our co-op placements, that the language and writing supports we have could be stronger. What I want to do, if we agree this is an issue, is start to unpack it. Let’s start to look by faculty and start to see what are the academic and non-academic reasons driving this retention. We can look at practices that have worked, both here and elsewhere. For example, I haven’t seen the data but I’ve heard in the Faculty of Management we boosted retention by four or five percentage points over the last year or so. So clearly, there’s something we did there. Is there something we can learn from that experience? I’m also curious to learn from some other universities in Nova Scotia and elsewhere. People make a big investment to come to Dal, and we pride ourselves in our high academic standards and we want to maintain those, but we’ve got to make sure that if we’re losing students, we’re not losing them for the wrong reasons. G: International student enrolment is rising every year. Is Dal doing enough to support them? RF: I don’t have a definitive answer, but I’d say probably not. Nova Scotia faces demographic challenges and it hasn’t been as strong on immigration as it should be. I think the universities, Dal in particular, should be leading lights in our ability to attract and retain people. I want us to be more of a role model in that area, and so, there’s likely more work to do in terms of support for international students. This belief is driven by enrolment growth but also this retention issue, which seems to suggest there’s something missing there. In terms of the specifics and where those investments might need to be or what they look like, I don’t know. G: This is an interesting time in the university’s history. 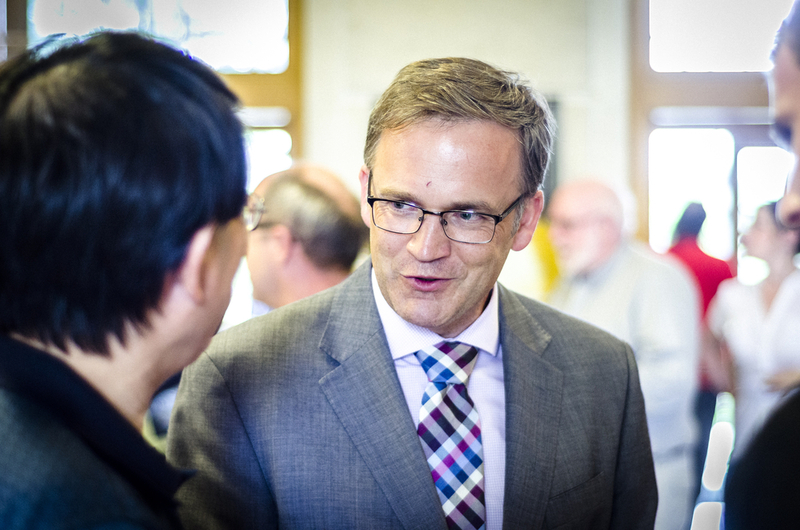 In 1992-93 provincial funding consisted of 74 per cent of Dal’s budget, now it’s 54 per cent. Meanwhile, tuition has gone up. It was 18 per cent of the university’s budget back in 1992-93, and now 36 per cent. Throughout this, Dalhousie has continued growing. Will this be a continued goal? RF: At Dal, we’ve balanced the books the last few years through enrolment growth; that’s what has saved us from much deeper budget cuts. Going forward we’re likely to see continued enrolment growth, but pretty clearly it’s likely to be moderated versus the last few years. We’re going to have to continue to really double down and focus on things like administrative costs. We’re going to continue to have to look at programs and continue to work really hard to make the case with the public and government for continued public investment. G: Do you see continued decreases in provincial funding? Do you still see tuition rising? RF: All I can talk about is principles; I don’t have specific projections. I think this government sees universities as a strong partner and I think we’ll see strong support for the institutions. Having said that, we have to look at the economic reality—the [province] just announced another deficit. It would be unwise to predict some dramatic change in the operating grant. In regards to tuition, I think it will [increase]. The challenge will be to keep modest increases and make sure that our absolute tuition is still in line with our compatriot institutions. G: Students are paying high tuition and with that comes questions. They look at the finances and ask why Dal is building so many new buildings. They ask, in the Faculty of Arts, for instance, why departing faculty are not being replaced. How do you calm those concerns? RF: I think those are absolutely fair questions. And I think that, as president and administrator, we are accountable to students as well as to all our other stakeholders in terms of explanations for that. In regards to the decisions we make, I completely understand the frustrations of the student who sees a class not being available but sees a building going up. I can completely empathize with how frustrating that would be. At the same time, I have to recognize that the condition of our facilities is second-worst in the U15. I have to find a balance. G: An interesting note brought up in the 100 Days report is the amount of undergrad programs—the highest of any U15 university. Do you envision that we’ll have to cut some faculties in the future? RF: I don’t know. I don’t think people should jump to any conclusion automatically from that data. I could argue it both ways. I could say that you have this tremendous choice, and indeed we’ve marketed it to students as such: come to Dal, you have a mid-sized institution that’s not too huge, but has a fantastic breadth of programs. That’s a strategic strength, so why would you give that up? At the same time, you look at it and go, are we focusing our resources as best as we could? If you have faculty in one area and you don’t have them where the student growth is huge, is that fair? I’m wondering if there’s a way to compromise. In other words, can you maintain the choice and still be efficient? One of the examples that came up from our deans was from the University of Derby in the UK. In North America, a lot of these universities are doing this program prioritization to trim programs, whereas my understanding of what they did in Darby was to look for course overlaps. I think the example given by our [Faculty of Agriculture] dean David Gray was a research methods course. If you have 26 different courses, do you really need 26? Or do you need 12? Or do you need six? To me, that has some real appeal. G: A surprise in the first semester was what happened with the libraries. We saw a student outcry when the Killam weekend hours were reduced and when the acquisition budget run out earlier than anticipated. What are Dal’s plans to protect its libraries? RF: I haven’t really talked about it this way, but it’s really a side-effect of what I think has been, overall, the strong way Dal has handled the budget. A lot of universities when faced with budget cuts, you’re faced with two sorts of options. One is across-the-board cuts; the other is to do more targeted cuts. That’s where you see universities considering program prioritization. The way Dal has handled these budget cuts is somewhere between those extremes but probably closer to across-the-board. I think it’s been well-handled. The downside is you have instances like this. If you do things that are a bit more across-the-board, you run the risk where everyone gets pinched. Then you run into things like, wow, the library cannot buy books anymore. That’s a real problem. What this means for our overall budgeting process, I’m still not sure. I guess I go back to those two extremes. When things get really tight, and maybe we’re at the point at Dal, we’re going to be more targeted. Maybe that’s the implication. But do we go full-blown to a program prioritization model? I’m not quite convinced. G: In a 2011 student survey, athletics was ranked last in a list of 10 student services by importance. You’ve made a commitment that athletics will not face a cut bigger than any academic cuts, which is not terribly encouraging to Tigers supporters. 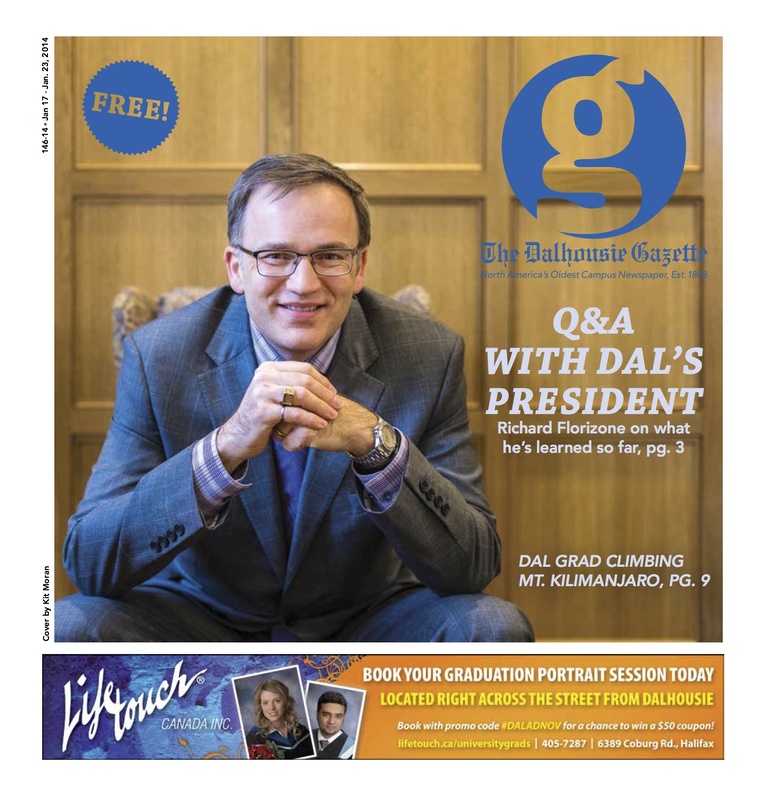 What’s the future of athletics at Dal? RF: I know there’s a lot of history here and a lot of debate. I just want to hit pause on any further cuts, and have a discussion about where we go in regards to athletics. I think the student data is interesting, but I think there are [aspects of athletics] that students are very interested in, like the new fitness facility, which is a shared interest with varsity athletics. While we’re taking this pause, we’ll look at how we’re supporting it and look at it relative to other U15 institutions, so that we can at the end of this three-year period produce a more refined view on where we should go. G: You replaced Tom Traves, who spent 18 years on the job and saw remarkable growth during his tenure. What do you hope your legacy is as president? RF: It comes back to these words that have stuck with me for the past few years: global standards and local impact. It’s so that someone will look back and say Dal is clearly a top 200 university in the world, that it is doing education, research and service among the best in the world. That it’s had a global impact. But that if you zoom in and look locally, it’s recognized for achieving a tremendous effect, on our local region—not just in the students we approach and the knowledge we generate, but as an engine for the social and economic and cultural development of the region. This interview was conducted on Jan. 9. It has been condensed and edited for clarity.